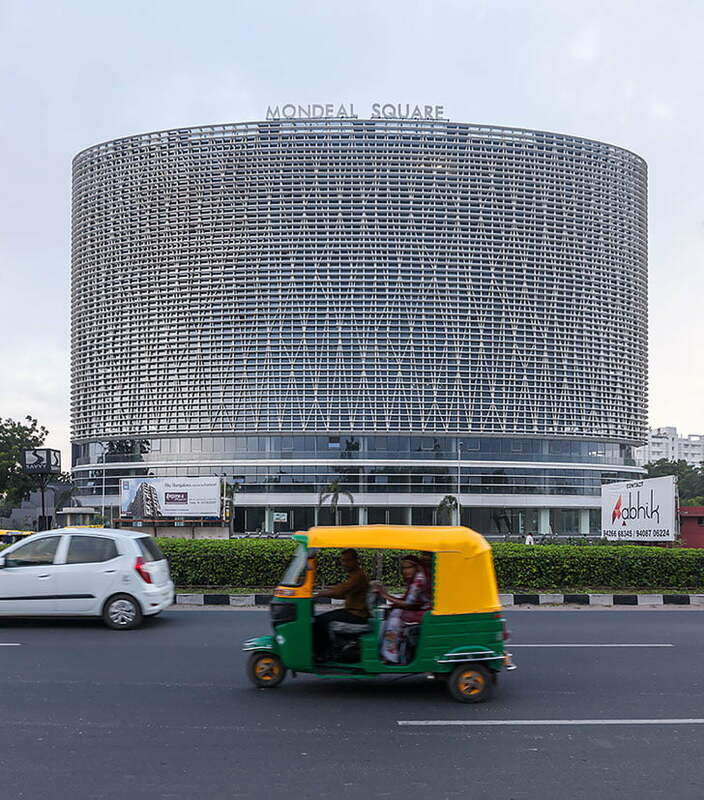 Multifunctional spaces architecture: Multi-functional Building “Mondeal Square” in Ahmadabad, Gujarat, India with its approximately seven million inhabitants, Ahmadabad is one of the largest cities of India and one of the world’s fastest growing metropolis. 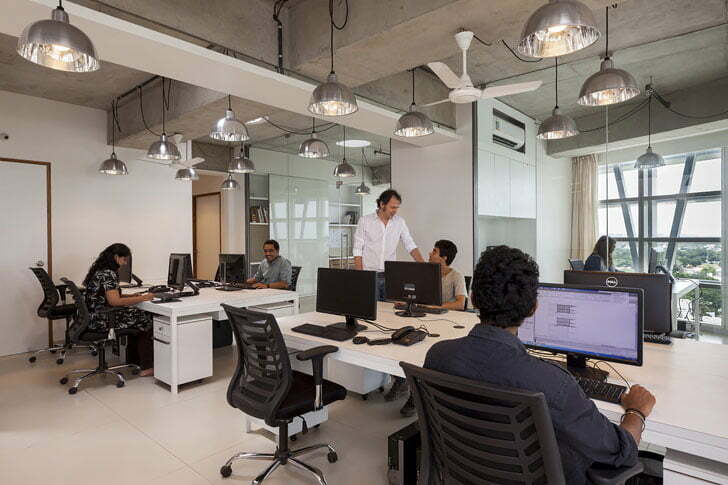 This is where the architectural and design office Blocher Blocher India Pvt. 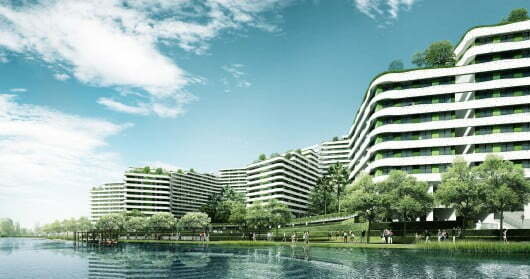 Ltd. has planned and implemented the multifunctional building complex, Mondeal Square. A highlight: the largest LED media facade of the country. Ahmadabad. What constitutes a landmark? 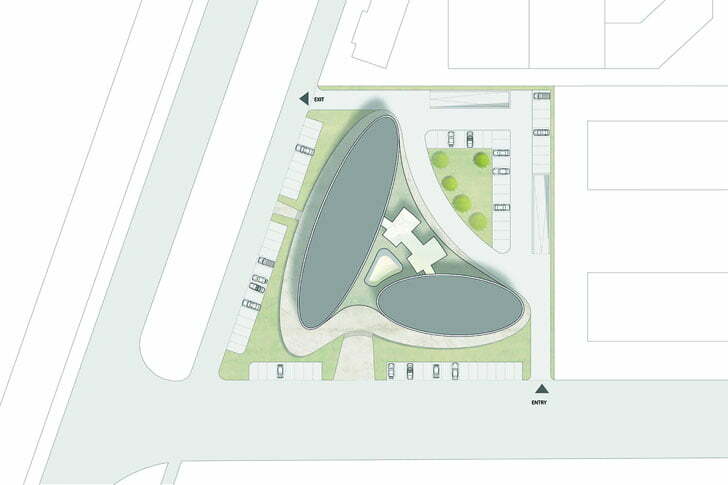 To shape the face of a city and present a point of orientation for resident and visitor. 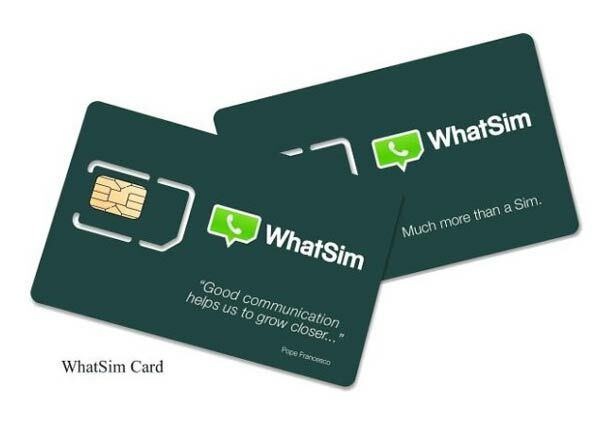 Two characteristics, which Mondeal Square satisfied already soon after its opening. 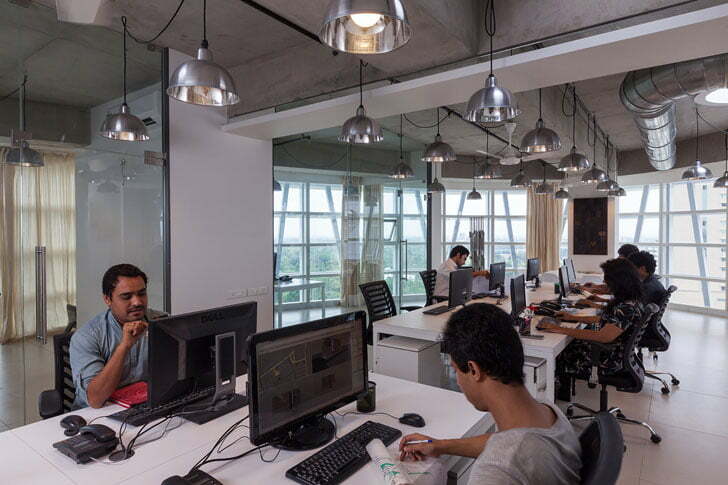 Located in Ahmadabad’s burgeoning suburb Prahladnagar on the S.G. Highway, the ensemble offers a total floor space of 17,000 square meters, of which 3,600 comprise commercial space, as well as ten storeys for office usage. During the day, the striking structure of the curtain facade defines the two buildings. The vertical struts and horizontal panes made of white aluminum profiles serve not only for a long-range effect but also for shade. 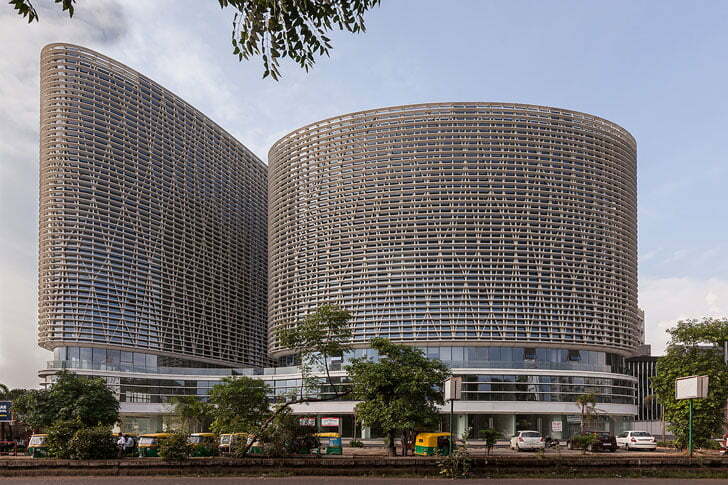 A significant locational advantage in India’s sunny west, and a statement for sustainable construction, as this, after all, reduces the use of air conditioners. As a contrast to the main facade, the rear side of the building is stylishly more restrained with a horizontal lamella facade. This is where the stairwells are located, also providing access – besides the elevators – to the office floors from the third to the tenth floor. The way these can be designed is exemplified by Blocher Blocher India on the top floor. Open exposed concrete ceilings and light grey tiles interplay with glass dividing walls, conveying a sense of minimalistic elegance and transparency. Wooden wall elements and the light interior provide the premises with warmth and increased quality-of-stay for the employees. 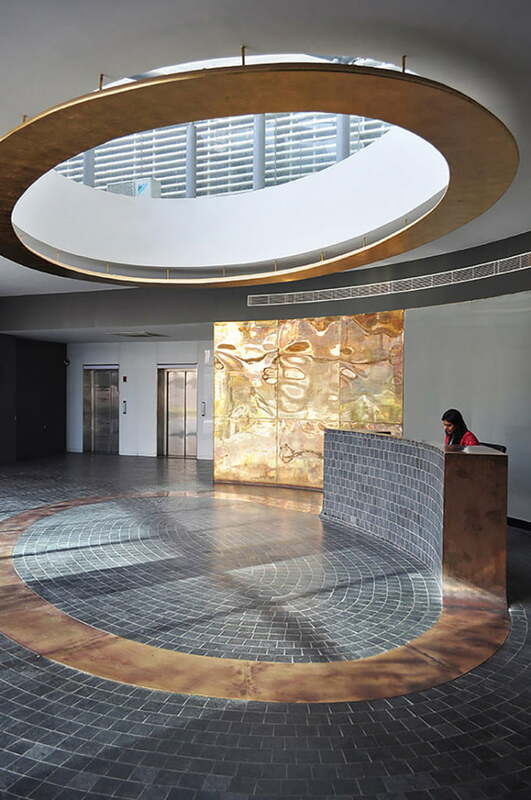 From the words of “Atelier dada – Architects of Light” : Atelier dada, an architectural lighting design studio, led by two architects, Mr.Nirmit Jhaveri and Ms Marie Ikram Bouhlel, who were professionally engaged and are responsible for the overall lighting and video content design of this multifunctional building project. As lighting is an important character of this multifunctional building project credits goes for architectural lighting design (building illumination and video content, interior public spaces and landscape) to studio “Atelier dada – Architects of Light”. MONDEAL SQUARE – Enjoy Your Breeze from Atelier dada on Vimeo. At night, the ensemble unfolds a very special charm. 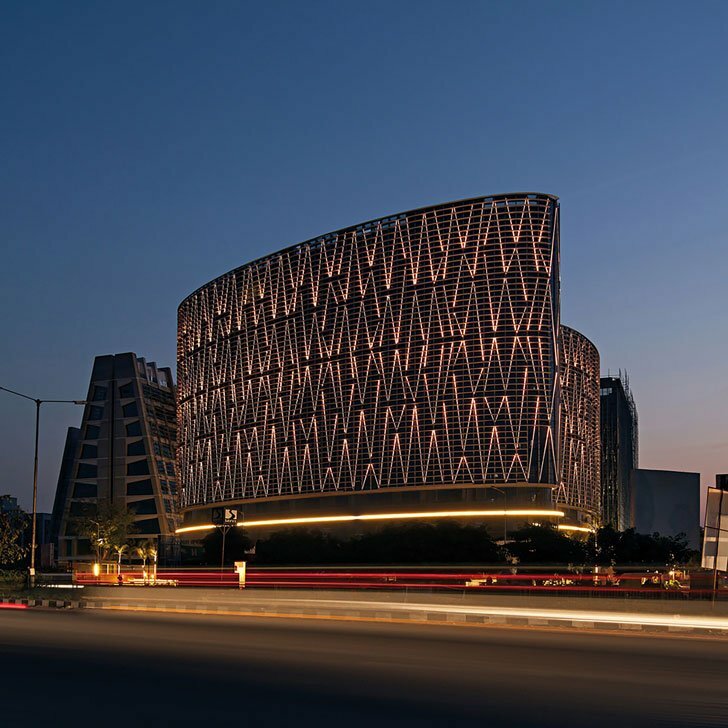 The buildings have the largest media facade in India, consisting of LED bands with a total length of approximately five kilometers, covering the 5,300 square meter glazed facade. They can be lit completely individually to display movement, color sequences or even silhouettes of moving figures. 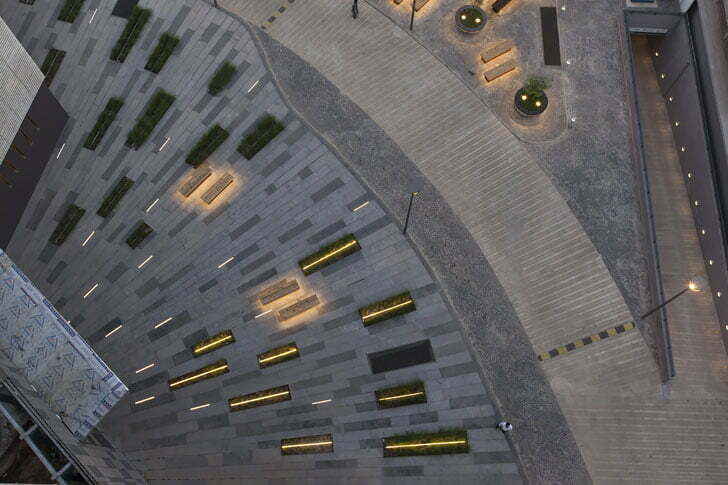 The differently sized, large square openings of the rear facade also light up then, and together with the illuminated plaza with furniture, staircases and vegetation culminate in an illuminated crescendo. A touch of gaily colorful art in the urban space. And this in a deeply symbolic location. 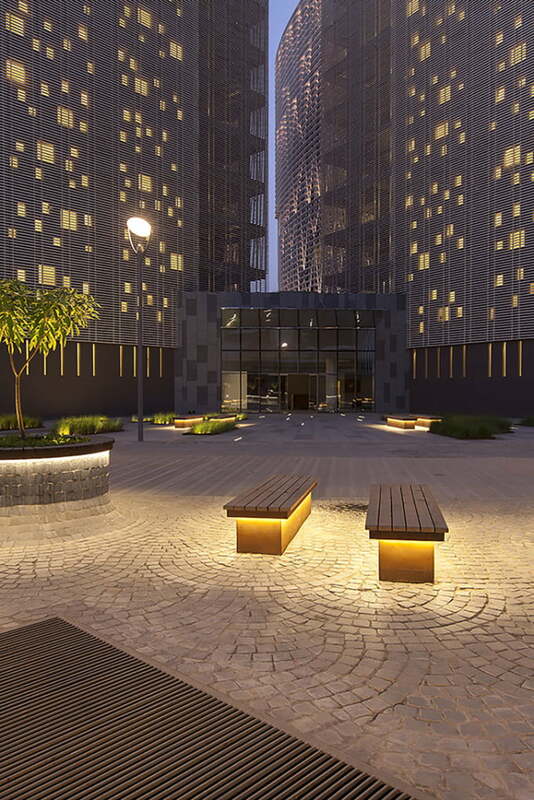 Situated on a striking corner plot, by virtue of the elliptical shape of the buildings, two lifelines of the city are brought together, namely S.G. Highway and Prahladnagar Road. The buildings meet the passer-by with an inviting gesture – also because of the fusion of architecture and public space. The outdoor areas and staircases pick up on the height differences of the surroundings, and form an organic unit of plateaus and stepped landscapes. The Planners, moreover, renounced an obvious, structural boundary and relied on palms as a natural green marker. They are at the same time a symbol for the aspiring Ahmadabad and the rich history of the city.